Ep 1: Will I Bark like a Dog? 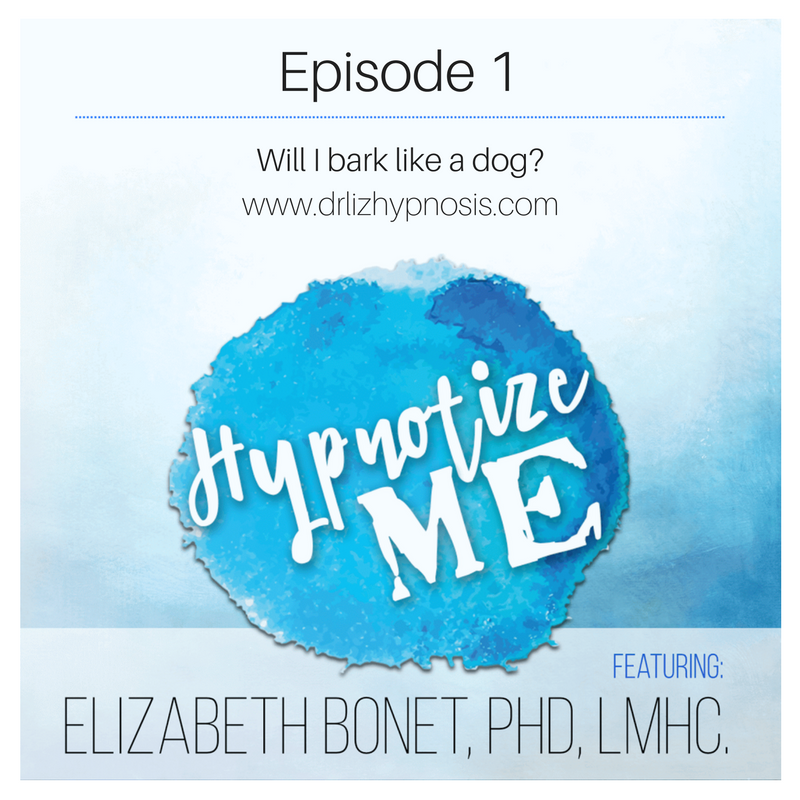 Dr. Liz talks about frequently asked questions (FAQs) about Hypnosis. Are you going to bark like a dog? Can I talk during hypnosis? If you have a comment or question, email drliz@drlizhypnosis.com. Am I going to bark like a dog? Ruff. OK. No you’re not going to bark like a dog or a quack like a duck! I think these are so funny and I understand like a lot of them come from the stage hypnosis and show hypnosis where maybe somebody went to a show one time and you know the hypnotist made them do something and raise her arm so no one can make you do anything in hypnosis that you don’t want to do. You are not in a state where you know they can tell you to go do crazy stuff and you’ll do it. It just doesn’t happen. So that’s like Myth number one. Hypnosis is like a deeply relaxed state. That’s really all it is is a deeply relaxed state. There’s been brain studies about what kind of brain state you’re in. You go into deep relaxation in hypnosis and meditation. It’s actually very similar to meditation. If f you’ve ever been in relaxation, savasana, at the end of a yoga class and really you were able to drift off . . . That’s very similar to hypnosis and the hypnotic state that you go into. If you are driving along in your car and your day dreaming and you suddenly are at your location because maybe it’s on autopilot. That’s very similar to hypnosis. That is actually what we consider a semi-hypnotic state. And what they found is that people drift into that state about six times a day. So whether it’s staring at your computer your phone or driving or sometimes you’re just like doing dishes and staring off and your kids ask you a question and you have no idea what they asked you. Right? You’re in like a semi hypnotic state at that point. So. It’s a state that we can all access to see that we do access all the time. The only difference in hypnosis is that you actually ask someone to take you there and to make suggestions that you think will be helpful for your life. So that is the difference when people come in with a problem and they want to solve that problem and they’re asking a hypnotist, a hypnotherapist, a psychotherapist, a psychologist (in Broward County if you’re local) for help with that problem. And that professional knows what to do with that problem. They know what kind of suggestions to give you and it comes from spending some time with you too. It’s not just like oh you walk in the door lay down on the couch and boom you’re in hypnosis. It is a process of getting to know you some and getting to know what problem you’re facing and what have you tried to solve it and what has been helpful and those type of things. So it is a relationship between you and the hypnotherapist. This is a really good question. Are you going to be so floaty and up in the clouds that you can’t drive? And the answer is hopefully not! If you have someone who’s trained and a good hypnotherapist they are going to ground you afterwards. They’re going to bring you out from hypnosis, out of the deeply relaxed state and ground you and talk to you a little bit and have you plant your feet on the floor and see what was helpful about this session for you. So that you’re grounded enough to go out and drive and it is really a safety concern. There’s hypnosis for irritable bowel syndrome IBS. It’s an extremely well researched protocol that I’ll talk about in a future episode but that one is seven sessions every other week. It’s a protocol that comes out of University of North Carolina Chapel Hill. So that’s 14 weeks.. Every Other Week seven sessions and that’s again a prescribed problem. If you’re coming in for depression, Anxiety, heartbreak. Sometimes people come in for it’s really going to vary with what you’re facing. So keep that in mind when you’re making that appointment. Sometimes I get calls and people think they’ll come in for one session and they’ll be done. And occasionally that happens. It’s really effective depending on what you’re facing in one session and you’re done. But most of the time you’re looking at one to three sessions at least and sometimes more than that. Am I going to lose control during the hypnosis? Can I lose control? Is that going to happen? And again you are always in control during hypnosis and you can talk during hypnosis. Often hypnotherapists will ask questions during hypnosis to get some information about what’s going on with the client. And you can talk them and go right back into trance. You can stop hypnosis at any time. Some therapist set up signals, like finger signals where the client can say to stop or to answer questions that those finger signals. So the finger signals are called ideomotor finger signals. That’s the official name for it. But basically what happens is you set up like raise your index finger if the answer is No. Or raise this finger if the answer is yes. So that way the client has an easy way to communicate without having to come to full wakefulness. But even if they do come for wakefulness then they can go right back into trance and that’s generally not a problem. Will I fall asleep in hypnosis or also similar to that is Will I have amnesia for what was said? So this is a really interesting and I have had clients fall asleep. They get so deeply relax that they are just out. And it sounds a little bit different when they’re asleep, like their body movements are different. So occasionally that happens. And what I always tell them is, “wow they must have really needed that rest!” Often I’ll see moms who come in and they’re overwhelmed and they’re exhausted and it’s like yeah they need some really deep sleep sometimes. So in general, most people do not sleep during hypnosis. You’re in a very deeply relax state and you access ways to help yourself change. And suggestions to help yourself change towards better health and better living. So generally you don’t fall asleep or just very deeply relaxed but occasionally it does happen. Yeah absolutely. The other thing is will I not remember it. Generally you will remember the hypnosis session. You can hear everything that’s being said. And again as a hypnotherapist we have some techniques to help people stay in a gentle wakeful state versus a deep deep sleep. But sometimes that sneaks up on us if a client goes that deeply. So generally you remember almost everything in the session. You may drift dream and float. And that’s often a suggestion I give, that you don’t have to pay attention to the words. And that’s a lovely lovely part of hypnosis. Your thinking mind can go to sleep, your thinking mind can rest. It doesn’t have to be on all the time. And the hypnosis will work because it bypasses the thinking mind. If we could think our way out of all our problems, hey, it would be awesome. But sometimes we can’t. So hypnosis is useful for that. Can I do self-hypnosis? Is self-hypnosis effective? And I have like a hands down – Absolutely. Yes. It’s effective. My goal for you as a therapist and most of the hypnotherapist I talk to is self-hypnosis. There’s an argument that every hypnosis is self hypnosis really. I’m just your guide. I’m your facilitator. Any therapist is your guide and facilitator but you’re the one who goes into the hypnotic state. You’re the one who creates it for yourself. And when you listen to a hypnosis file at home or when you’re able to access that state on your own, that is self-hypnosis and that is always the goal. Like. yes, walk out of my office and be able to do this on your own. Absolutely. This is a wonderful, wonderful thing and most people can do that. So that is the end of episode. I hope that was helpful for you today and in future episodes we’ll talk about different questions that come up about hypnosis. But I wanted to cover those brief ones today. By Dr. Liz|2017-03-13T16:00:39+00:00November 30th, 2016|Comments Off on Ep 1: Will I Bark like a Dog?